I’m not sure what other bloggers do when they write. Most are probably in a delicately decorated office/craft room or maybe in a local cafe with a coffee and scone. Me? I do my blogging in a giant leather chair while watching old episodes of Law & Order SVU. God bless Hulu. It’s probably not the best way to watch Law & Order episodes. I sort of fade in and out while I type and edit pictures, which means half the time I’m not sure why that dude is no longer a suspect or how many babies that teen girl has thrown away. But, I like the background noise and the interesting characters. I think it spurs my creativity. But can someone tell me how the medical examiner knows so much about things other than dead bodies? Like in the episode I’m watching tonight, which centers around an exotic animal smuggling ring, she identifies a parrot found in the murdered woman’s purse as an endangered species, and later pops into the police station to tell the detectives that the bite marks on the victim belong to a tiger, then proceeds to guess what type of tiger and gives a speech about how much money can be made from animal trafficking. If I were Benson and Stabler I’d watch my back because this woman is obviously about to take their jobs. Oh, and I’d watch my back because she’s also a demon (played one in Devils’ Advocate). Tamara Tunie. Look it up. You know what else is sneaky like that medical examiner on SVU… white chocolate. I tell myself I don’t like it, I refuse offers of it from others, I scorn the flavor in coffee shops, but yet, whenever I bake something with it, I inexplicably fall in love. This recipe wasn’t too hard of a sell. 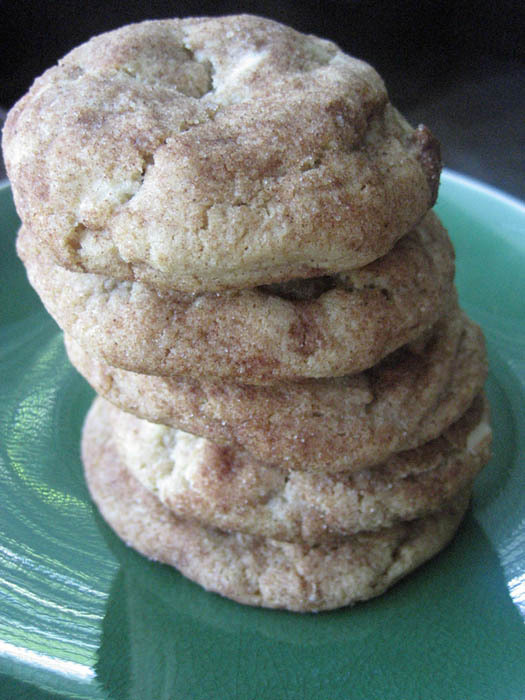 I may not be a fan of white chocolate, but I am a big fan of snickerdoodle cookies. 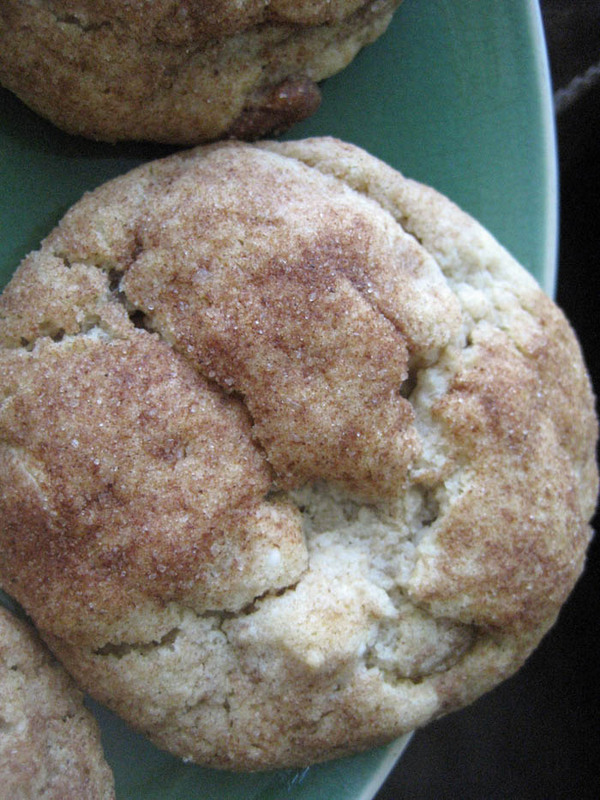 I’m not sure a semi-sweet chocolate would taste so great inside of a snickerdoodle cookie, but a creamy white chocolate? Yes, this could work. And with pudding in the mix? This could be good. 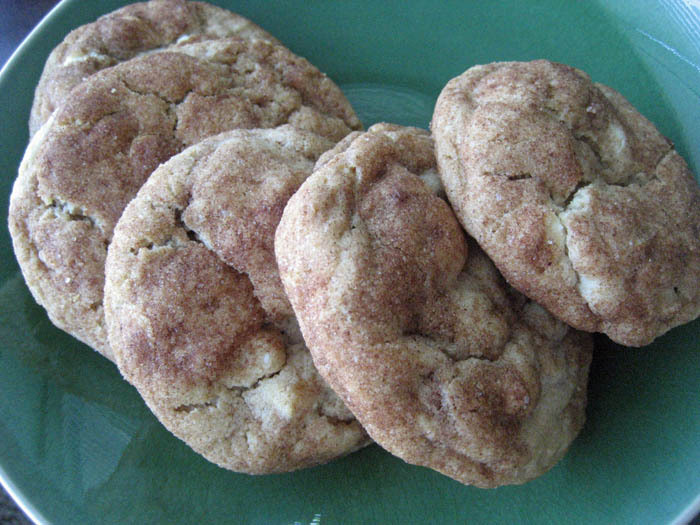 I knew cookie dough with pudding mix makes for a super thick and soft cookie, but I didn’t know white chocolate and cinnamon sugar went so well together. The flavors meld in a smooth and fragrant combo. I feel like this would be an excellent cookie with coffee. Or milk. Or water. Or whatever’s in your cup. PS – this is my 100th post 🙂 I might have my cookies with some champagne. Preheat oven to 350º. Prepare baking sheets lined with parchment paper. In a stand mixer, cream together the butter and sugars. Add eggs first, and mix, then add remaining ingredients (reserving the tsp cinnamon and 1/3 cup sugar). Mix well. Combine the cinnamon and sugar. 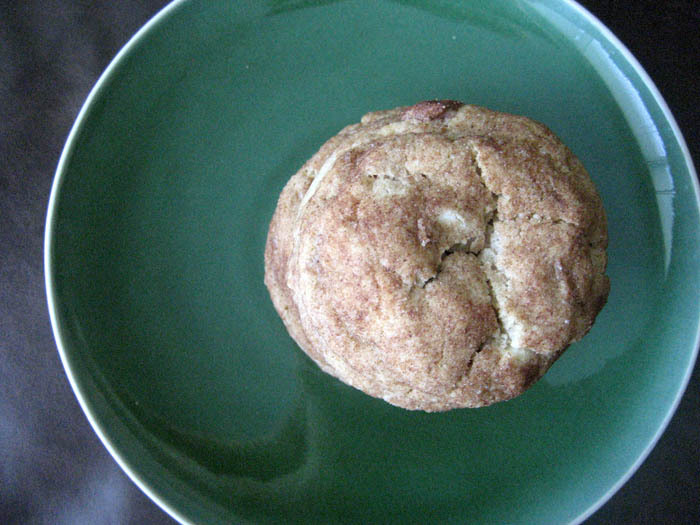 Scoop and roll the dough into balls, then roll in the cinnamon sugar, coating completely. Place on baking sheet about 2 inches apart. Bake for approximately 10 minutes, until slightly golden and just set in the middle. Let cool on baking sheet. 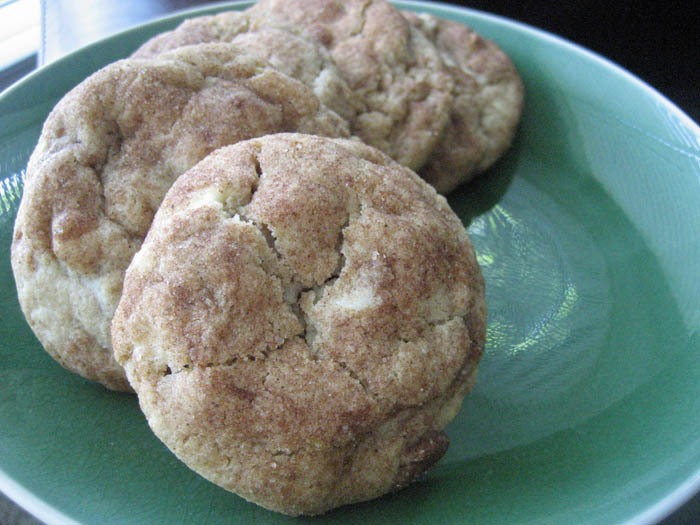 I’ve been looking for a good snickerdoodle recipe and these cookies look so soft and delicious! Happy 100th post! Totally agreed on white chocolate…but somehow it sounds like it’d be awesome in a snickerdoodle!